The kitchen hasn’t seen much action from me lately, as my parents are visiting. That means having the luxury of coming home and having dinner already waiting for you, made by my mother! 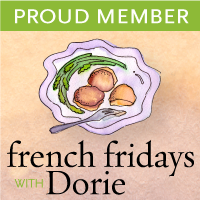 My mom is a wonderful cook, and my love of all things food and cooking is thanks to her. But while I picked up the basics of cooking from my mom, I’ve become the resident baker in the family. So I went back into the kitchen last night to give the oven a bit of a workout with some overripe bananas that were too far-gone to eat. The first banana were made into Banana Oatmeal Chocolate Chip Cookies. For the second banana, I’ve been eyeing this Banana Split Brownies recipe for the longest time, and thought it was about time to stop eyeing them and actually bake them. 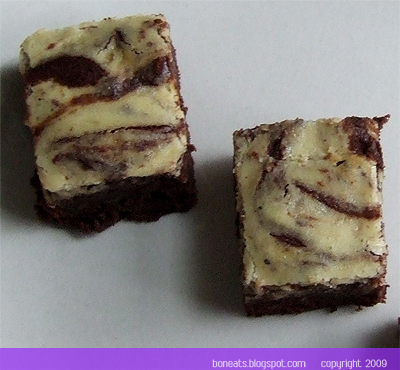 For fans of cream cheese, you will love this, as this is essentially a cheesecake brownie with mashed banana added into the cream cheese mixture before it’s marbled with the chocolate brownie batter. 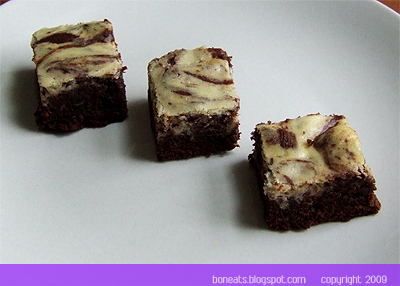 The result is an incredibly dark, rich and sinfully decadent square of brownie with a tangy, not-too-sweet cream cheese layer that has a hint of banana to them. It’s a nice way to use up an overripe banana, and a great variation on the cheesecake brownie. The recipe claims to yield 24 squares, but because how rich and decadent these are, I think you can get a lot more by cutting smaller squares. A little goes a long way! It’s hard to imagine summer is merely two weeks away, especially with the weather we’ve been having lately—lots of rain and cooler temperatures that barely even reach the average for the time of year. But my frequent trips to the market tell me otherwise when I’m greeted by new produce that become in season. So I caved and bought them. I’m used to eating the smaller varieties grown in Thailand or China, so lugging home three huge mangoes (of the Haden variety) was a bit daunting. I knew that at first sight though, one of those mangoes would be put to use in a stir-fry. 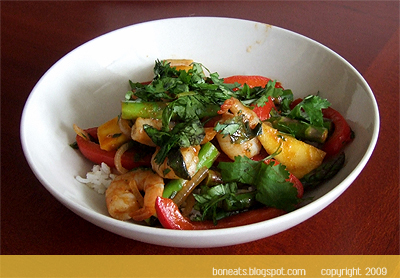 I ended up doing a Thai treatment, making a stir-fry of asparagus, red peppers, mango, shrimp and Thai red curry paste. 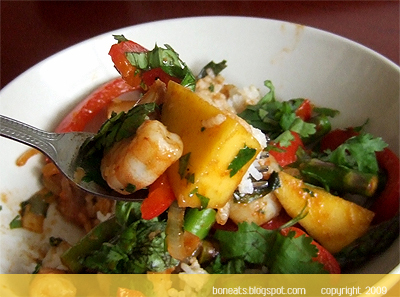 The sweetness of the mango cuts through the slight heat of the red curry. If mangoes aren’t your thing, this stir-fry can work just as well with some fresh pineapple or lychees (it’s all about playing with the sweet/spicy/savoury flavour combination), and you can replace the shrimp and vegetables with whatever you like. If you like it extra spicy, throw in some extra Thai peppers. I added some fresh basil and cilantro at the end, and served with steamed rice. 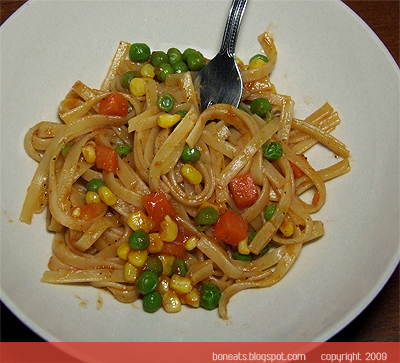 A quick fix for dinner, this can also be a cheater’s approach to satisfying one’s Thai curry craving. Rinse the shrimp and pat dry. Place in a small bowl, and marinate with the cooking wine, salt, black pepper and cornstarch. Stir and set aside for 15 minutes. Heat 2 tablespoons vegetable oil in a wok over medium heat. Add the shrimp and stir around wok for 2 minutes, until the shrimp begin turning pink but is not cooked through yet. Remove to a plate and set aside. Add the onions into the wok and stir-fry for 1 minute, or until fragrant (if pan appears to be a little dry, add a bit of vegetable oil). Add red peppers and asparagus, stir, cover wok with lid and let cook for 1 minute. Remove lid and add mango pieces. Mix 2 tablespoons of water with the curry paste to loosen it, and pour over the contents of the wok. Add the rice vinegar and soy sauce and stir to combine. Add the shrimp; toss to combine and let cook for 1 minute more, or until shrimp is cooked through. Turn off heat and add the herbs. Season with black pepper, if desired. Serve immediately with steamed rice. A while back ago, a few friends and I got into a discussion over lunch, after one of them mentioned eating her Swiss Chalet chicken with ketchup. Consequently, such a comment made some us for cringe at the thought. Chicken with ketchup? Especially in place of Swiss Chalet sauce (I know my brother would be appalled; he swears by the sauce and always gets extra sauce)? But after a discussion on how much is too much, I realised that I too use ketchup quite often. According to the statistics presented at the 8th World Tomato Congress last year, 35.8 millions of tons of ketchup was consumed worldwide in 2008. What is with our fascination and love with ketchup? But while it is consumed by many, ketchup is still merely relegated to the role of “condiment”—not even a sidekick to the star of the show, but an extra on the plate. I never really thought how big of a role ketchup played in my life. Like many people, I’ve taken ketchup for granted since I was a child. 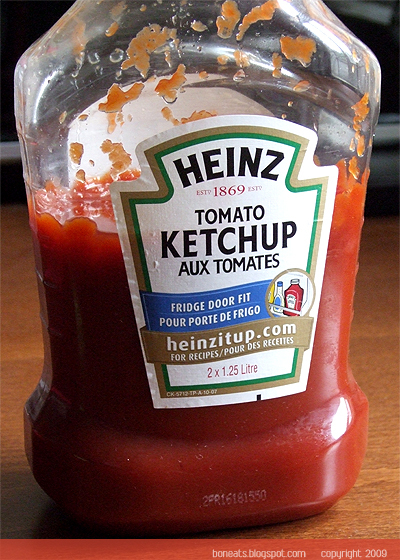 I ate ketchup the traditional way, adding them to my fries, my hot dogs or my Pogos (uh, remember those?). I even dipped my chicken nuggets and my fish fingers into the red stuff. And as much as I cringe at the memory, I used to eat my steak with ketchup (I was five and didn’t know any better). However, I never did pick up the habit of eating scrambled eggs with ketchup, despite watching many fellow peers do it in 1st-year (forgivable at times with the bland, dry as rubber eggs they were serving us), and I only managed to briefly experiment with ketchup in my KD following my 3rd-year roommate’s habit. But I remember that as I kid, my mom would sometimes make me ketchup pasta. I recall trying to make it myself, probably when I was about eight or nine, thinking it was as simple as throwing boiled pasta and ketchup together. One forkful of it made me realise, in utter disappointment (and disgust), that it wasn’t. It’s not meant to drench the pasta like tomato sauce is. Heating the ketchup in a pan with some oil ensures that you get a thin coating on the pasta, enough to coat the pasta and give it a pinkish tinge, as well as the right amount of sweet-and-sour tang. And one of my favourite Japanese dishes, the omurice, uses a tomato-based rice filling—more often than not ketchup being used as the based, and then drizzled on top of the omelette to finish it off. Perhaps part of it is my love for the sweet-and-sour flavour combination; perhaps part of it is are memories and habits I’ve retained from my childhood. Sure, it may weird people out to use ketchup with pasta, or to see me eating my fish and chips with ketchup (which I still do), but old habits die hard. And at least I can rejoice in the fact that at the very least, I don’t eat ketchup with everything. What do you like to have your ketchup with? It’sgreat when you can always rely on something or someone: a family member for their unconditional support, a friend to lend an ear, a consistent cup of coffee at your favourite café, or in this case, a stellar recipe you can always depend on. 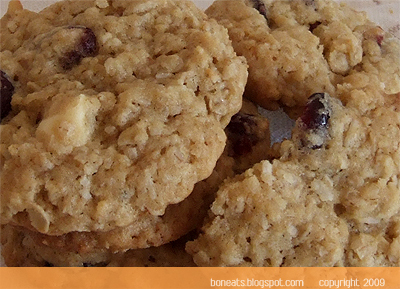 Such is the case with these Cranberry Coconut Oatmeal Cookies. I have been baking these cookies for a good number of years now, often substituting ingredients for variation. 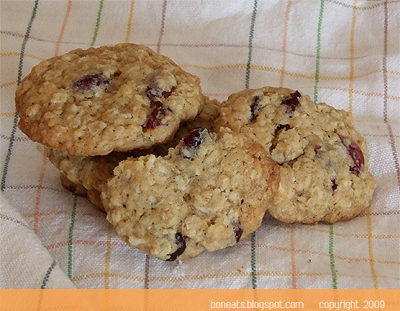 My adaptation of the recipe always yields wonderfully delicious cookies—a crispy exterior with a moist and chewy centre, and lots of texture from the oats, coconut and cranberries. It’s just the right amount of sweetness and chewiness, with a slight tartness from the cranberries, which can just as easily be swapped for some raisins, chopped dried apricots, or another favourite of mine, dried cherries. I often made these during my university days because they freeze beautifully. I can always make a double batch, freeze them, and grab a few out whenever I need some quick snacks to-go for a study session or an essay marathon. Being chock full of healthy ingredients, the cookies are also a great source of quick energy, and make the perfect snack in lunches. Feel free to add some chopped toasted nuts if you like, or for a bit of indulgence, a handful of chocolate chips. A coworker had been craving some white chocolate and macadamia cookies last week, and while I didn’t have any macadamias on hand, I threw in some white chocolate for her and the rest of the office. Regardless of what you throw into these cookies, you can rest assured that they’ll always turn out great. And the best thing about a reliable recipe? You'll know it by heart after a few gos, and can easily and quickly whip up a batch for unexpected guests or cravings! Preheat oven to 375°F. Line baking sheets with parchment paper and set aside. In a medium bowl, whisk together rolled oats, flour, coconut, baking powder, baking soda and salt. Set aside. In a separate, large bowl, beat butter with brown sugar until light and fluffy, about 3 minutes. Beat in the egg and vanilla. Add in the dry ingredients and mix until just incorporated. Add the cranberries and any additional add-ins and, using a wooden spoon or spatula, stir until combined. Drop dough by heaping teaspoons, about 2 inches apart, onto prepared pans (I usually like to roll them into balls and flatten them to ensure a rounder cookie). Bake in the centre of the oven, rotating halfway through, until golden, about 10 to 12 minutes. Transfer to racks and let cool. Can be frozen for up to a month if stored in an airtight container or bag. It’s hard to imagine that it’s already been a year since I set up Bon Eats—a year of cooking, baking, sharing my successes and failures in the kitchen, and all-out stuffing my face with delicious food. Time sure flies when I’m having fun! Through this blog, I’ve been blessed to meet some fabulous people, and with the addition of my Twitter account, I’ve met even more. To be quite honest, I haven’t had much time to think of something super special for Bon Eats’ one-year anniversary. Life has been a little busy lately, and to top it off, June is the month of birthdays for me (mine included!). Factor in 1000 Tastes of Toronto next weekend and Summerlicious next month, I thought it was best to cash in my indulgence card in the latter part of the month (plus the dress I plan to wear for a wedding in two weeks will be thanking me!). 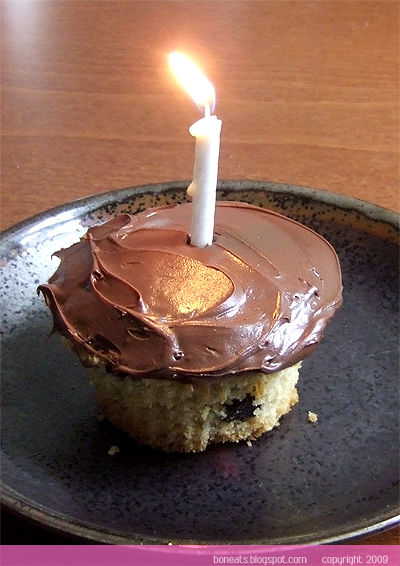 I did throw together a quick cupcake for the occasion though by using Nutella as a frosting for some chocolate chip muffins I made last night. And a little secret: I replaced half the all-purpose flour in the recipe with whole wheat pastry. This is also a great way to make instant cupcakes when you suddenly find yourselves entertaining kids. 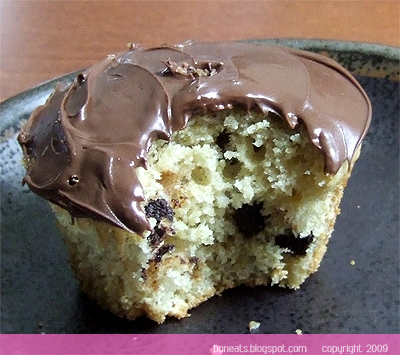 Just whip up some chocolate chip muffins or cupcakes and spread with Nutella—how can they resist? But then again, it could be my biased opinion (blame it on my inner Italian snobbery) that things taste better when there’s Nutella around! Lastly, thank you for all the love and support you’ve given me and my blog for the past year. I look forward to many more delicious posts to share with you all! !